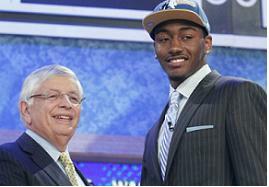 The Washington Wizards selected African American John Wall with their number one overall pick in the 2010 NBA draft Thursday. The selection of Wall will likely be regarded as a landmark achievement for the African American community, but questions remain whether he was the best player available in the draft. Though Wall scored 22 points a game for the University of Kentucky in 2009-2010, it was his first and only year with the team, leading many to point to the possibility that he could have merely had a lucky season. "One decent college season doesn't a top NBA prospect make," remarked Barry Walsh of the Fort Worth Star, "I think everyone knows the real reason this guy was picked number one." Specifically, some are claiming that Wall as the number one pick is an example of affirmative action – that he was given special consideration because of his minority status by the NBA and the Wizards, who play in a city with a predominately black population. "You're going to tell me that there aren't five white players better qualified to be that pick? Give me a break," said Walsh, "What about Jon Scheyer? He scored 728 points last season and led Duke to the national championship." Scheyer, who is white, was not drafted by any team on Thursday. He has been labeled by most NBA scouts as 'too slow' and 'weak'. "This has been the status quo in basketball for decades," commented Stu Price of the Individual Rights Committee, alluding to the fact that prior to 1951, over 90% of all NBA players were white, "This affirmative action is everywhere today – politics, colleges, show business, everywhere. Who's going to tell me Halle Berry deserved that Oscar for 'Monster's Ball'? Please. She wasn't in that movie more than twenty minutes."